SAN MIGUEL, P.I. -- A Birmingham seaman had a harrowing brush with a dreaded Mako shark while skin diving in the South China Sea, but escaped unscathed, thanks to his alert wits. In a letter to home, Seaman Ronald Kumpf*, son of Mr. and Mrs. Hume C. Kumpf, of Birmingham, related the spine-tingling adventure that occurred while he and a friend were week-ending on the Capones Islands. "Last weedend, Kurt, one of the families from the Base, and I, went to the Capones Islands for a picnic and some skin diving. "The most exciting event of the day took place while I was skin diving quite a distance off shore in water about 30 feet deep. Neither Kurt nor I took our aqua lungs along that day so I was just snorkel diving on the surface, when I saw a shark, about a four-footer, making a big circle around me -- deep down in the crystal-clear water. You can imagine my surprise and sudden fright! Well, it made one last big circle and disappeared into the dark water of a ravine. I guessed that it had come up from the deep water and was now returning there. Nevertheless I began to head back toward shore. "A few seconds later, while I was still far from shore and still in deep water, I saw a shadow out of the corner of my mask. I turned my head to look, and there, not an arm's length from me, swimming beside me, was another shark. The thing was no less than six feet long and the color of blue steel with a white belly and a pointed nose. Before I could do a thing it bent its body in the middle so that it was facing me -- and gave a sudden lunge! In utter terror of his gnawing my torso, I offered my arms and legs in a shower of bubbles. "The shark was, I guess, scared of the bubbles and moved away, but as soon as the screen of bubbles rose he again made a sudden attack! I kicked at his snout and waved my arms so violently and yelled and groaned, underwater, so much that he again retreated to a "safer" distance (about three feet). "I can truthfully say, that in all my life I have never been so terrified and so close to insanity. I could think of nothing but his pulling me down and killing me but he hadn't bitten me yet and I wasn't giving up. He stopped for a second and came at me again. I didn't have a knife or a spear nor any weapon to defend myself with since I was just diving to "look around". "Without a SCUBA I could not dive down to get away -- and since he was almost upon me again, I could not retreat. Suddenly it flashed through my mind that sharks have been known to be afraid of loud noises so I slapped my hand on the surface of the water with all my strength. I could just see his sleek head pass just six inches from my right leg, which was now pulled up close to my body. The sound of my hand on the water did the trick, for he turned and finned down into the dark water out away from shore. "I swam toward shore just as fast as I could, trying not to make any splash with my fins. I kept looking around and behind me, sure that it would follow me but it didn't. When I got to the beach I was exhausted and trembling with terror. It was the first time in my life that I really thought I was going to die. I had been frightened before but never felt that I was facing death. It's an awful feeling. "Well, enough of that, except that I should tell you that I have ordered a powered spear and knife from the Navy Exchange and that I'll never again go skin diving with nothing to defend myself with. "By the way, we have deceided from the color and shape of the shark that it was a Mako, which is one of the worst! Boy, am I lucky he wasn't determined!" 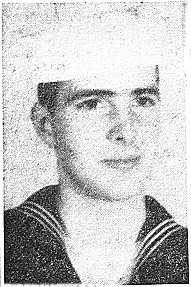 Kumpf* enlisted in the Navy in September 1960, took his boot training at Great Lakes, and graduated from Yeoman school in Bainbridge, Md., before being sent to his present post in the Philippines, last March. At San Miguel he has served as assistant editor of the station newspaper and is currently doing clerical work in the administration office. He was graduated from Pemberton High in 1960. Note: The first time I visited Key West, was on a Greyhound bus trip after graduating from Navy Yeoman school in Bainbridge, Md. I was on my way to the Philippines for two years. After returning from the Philippines, while stationed in Washington DC, Presedent Kennedy announced that Soviet nuclear weapons were in Cuba. I was immediately flown to Key West where, the very next morning, I was stationed at the southernmost point and was closer to Castro's Cuba than anyone else in America.